If you dare to look up while walking in San Miguel, you will often find a cross with a smaller crossbar placed above the main one, near the top. This is called the Patriarchal Cross thought to have been given to Saint (then King) Stephen by the pope as the symbol of the newly Catholic Kingdom of Hungary. The two-barred cross is one of the main elements in the coats of arms of Hungary since 1190. The top beam represents the plaque bearing the inscription given by Pontius Pilate “Jesus of Nazareth, King of the Jews” (often abbreviated in Latin as “INRI”, or as English speaking children jokingly learn is “I’m Nailed Right In”). 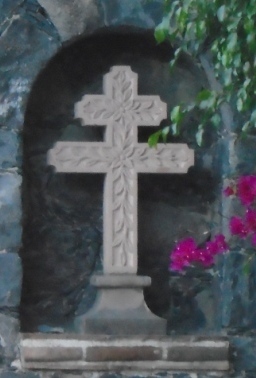 The Patriarchal Cross is said to have helped Jesuit missionaries convert the indigenous they encountered because the two armed cross resembled existing local imagery. Also the regular cross symbol was long used locally in worship as the intersection of the male and female. In modern times the Patriarchal Cross has represented many organizations including curing tuberculosis and the Free France movement in World War Two.